A new article highlighting some of our work communicating ecosystem services is to be published in Landscape and Urban Planning. The paper, entitled “Customising virtual globe tours to enhance community awareness of local landscape benefits” will appear as part of a special issue on Critical Approaches to Landscape Visualization. Please note that access to the full text of this article will depend on your personal or institutional entitlements. I have been busy examining the usefulness of digital geographic visualisations for bridging the interface between science and policy when discussing land use change in the UK. Take a look at the updated Sustainable Society Network+ page under Projects above. 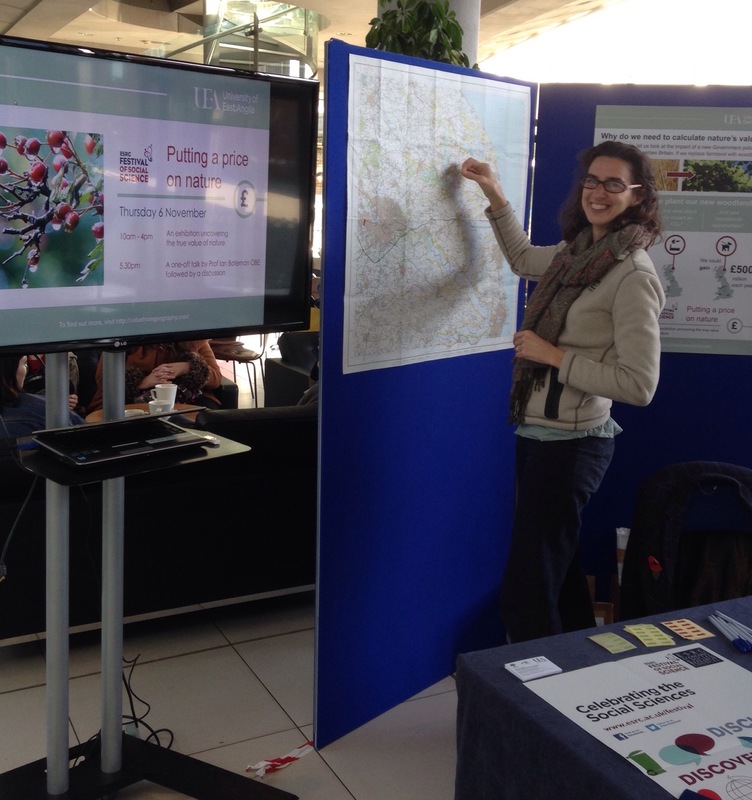 On Thursday 6 November and Saturday 8 November 2014, University of East Anglia researchers ran a series of free events on the theme of ‘Putting a price on nature’. This was a controversial title and so labelled to invite discussion. It did. Thanks to all those involved and for funding from the ESRC Festival of Social Science. Please see links at the top of the home page for further details or email me. Two great events: thanks to all attendees! Ruth Welters has already been blogging about the events on the CSERGE website (click here). I’m busy typing up my notes from the two valuing nature events (part of the ESRC Festival of Social Science). Please come back and check for updates, or follow me on Twitter (@AmiiHarwood). Just back from chatting to the people of Norwich about the importance of valuing our natural environment. Thank you to everyone who stopped to talk to us today. We finished the day with a great presentation by Ian Bateman and discussion. The day went far too quickly! Now looking forward to our final event on Saturday at the University of East Anglia. Come and see us on Saturday if you missed us today! How do we capture nature’s value? See Norwich in a way you never have before! Join us at the University of East Anglia on Sat 8 Nov 2014 – we still have some places left. Activities include a guided tour of the campus using a smart-phone based augmented reality tool and a fieldwork challenge. Data will be analysed in real-time and you will get to see your work on a 125-degree curved screen hosted at the University of East Anglia Virtual Reality Theatre. In the event of bad weather we will move inside, show you our facilities and take you on a virtual tour of Norfolk. No need to bring your own equipment. We welcome all ages and levels of interest – come along and see what we do. We have two sessions, each lasting about an hour and a half, starting 10am and 12noon. Please contact me to book a place.